VANCOUVER — Taken as a whole, from its efforts in the fall on the trails, to its spring-time results on the track, it’s a pretty safe bet to say that there has never been a more prolific period in the concurrent history of the UBC Thunderbirds cross-country, and track and field programs. After winning its first-ever NAIA national track title last June, the UBC men followed just over a week ago with its first-ever NAIA national cross-country title. The Thunderbirds women also won the national cross-country title and for them it was a dynastic fifth title in six years. They also finished fourth at last spring’s national track championships. With all of that winning, change is the last thing you might have seen coming, yet Varsity Letters has learned that UBC, in its quest to find an even better training environment for its talented harriers, is vigorously pursuing a change in its athletic membership for both men’s and women’s cross country programs, perhaps as soon as next season. “Our athletes know about it and our administration is exploring it,” began UBC head cross-country, and track and field coach Laurier Primeau about the prospect of leaving the U.S.-based National Association of Intercollegiate Athletics (NAIA) to join Canadian-based U Sports, within which it already competes in sports like basketball, volleyball, hockey, football, field hockey and swimming. 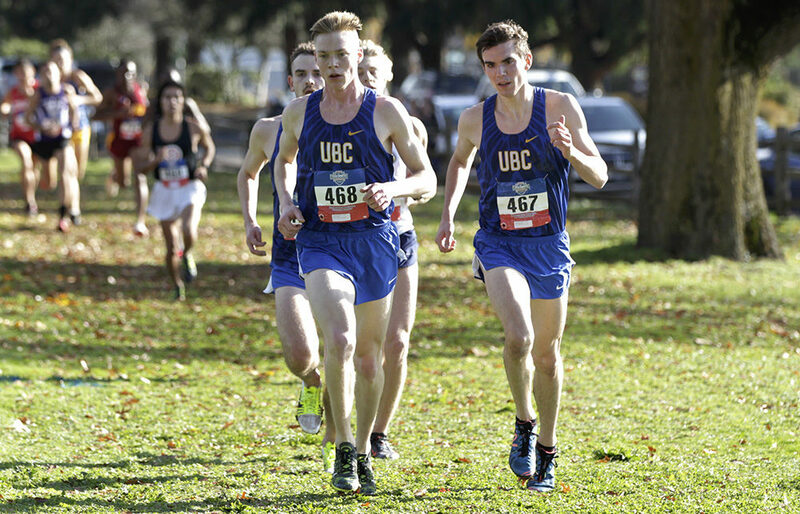 “Whether it was by word of mouth or official notification, it certainly was a topic of conversation at the NAIA (cross-country) championships,” Primeau added of the event which UBC dominated two Saturdays ago in Vancouver, Wash. There are still hurdles to be navigated before any such move could be called official. And UBC, which does not compete in winter’s indoor track season, would still retain its NAIA membership in outdoor track and field, as U Sports does not offer a spring track season and the school loves the aspect of being able to provide its student-athletes with the Canadian education-U.S. competition model. In that way, Primeau feels it’s the best of both worlds because while UBC athletes have been ultra successful in NAIA cross-country, the head coach feels the requirements in place to compete at its collegiate national championships places too much much physical demand on the athletes. Primeau would cut the schedule back slightly in order to enhance their success at the national championship level in Canada. “Right now, in order to be eligible (for NAIA nationals), we have to have competed in four meets before our conference (Association of Independent Institutions) meet,” begins Primeau. “Then we go to the AII meet, then to the NAIA nationals, and from there, our best athletes go on to the Canadian championships. That is seven (meets) in nine weeks, and that is too much racing. In U Sports, there is complete freedom to schedule meets to best suit the end-in-mind for each program. As well the conference championship finish for the Canada West conference are actually gleaned from the overall finish at the U Sports national meet. “In my opinion, that system provides us with a better opportunity to develop athletes for provincial and national teams,” says Primeau. “Putting on the maple leaf is the most important thing. Our focus is to help athletes make Canadian teams. When the Canadian club championship is the seventh meet in nine weeks, it leaves too much to chance in terms of racing success. And not just success in the short-term but in the longterm, well past the expiration of their UBC careers. At the Canadian championships, held in Kingston, UBC alum Luc Bruchet won the senior men’s race, while second-year Kieran Lumb won the junior men’s race, headlining a large pack of past-and-present blue-and-gold harriers. Alas, there is still one issue to resolve, and while it is substantial, Primeau correctly points out that a precedent has already been set. “Our biggest hurdle right now is that current U Sports rules state that if an athlete expires eligibility in one jurisdiction, that athlete can’t finish the fifth year in U Sports,” he begins of the fact that both the NAIA and NCAA have four years of eligibility while U Sports allows five years.